ITEA 2 Symposium 2009 was held in Madrid, October 28-30. Elvior demonstrated in D-MINT project booth its model-based testing technology on the street lighting controller case study. In addition to Elvior D-MINT booth demonstrated the model-based testing case studies from different industry partners — Daimler, ABB, Eliko, Nokia Siemens Networks, SQS, IDEKO. 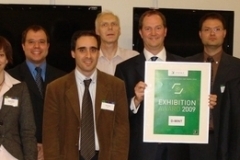 Each year, the Exhibiton Award goes to the project team that communicates the ambition and goals, and – if already possible – achievements and results of its project in the most understandable and vivid way at the ITEA 2 Symposium exhibition.The Exhibition Award is not about the most beautiful stand but concerns rather the clearest way a project is presented. This year’s exhibition Award went to the D-MINT project. 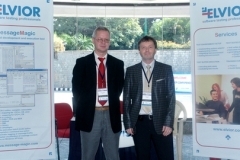 The TTCN-3 Users Conference Asia (T3UC) 2009 will take place in Bangalore, India November 17-19, 2009. 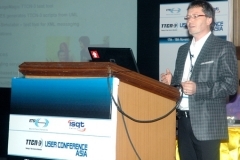 T3UC Asia 2009 will bring together the TTCN-3 community to witness the application of TTCN-3 beyond telecommunications testing in new areas such as embedded system testing and automotive software testing.T3UC Asia 2009 is jointly organised by the European Telecommunications Standards Institute (ETSI) and ISQT. It will feature tutorials and presentations from members of the TTCN-3 user community and other invited speakers.Elvior is supporting the event as a silver sponsor and exhibitor, showcasing its TTCN-3 technology offers. Elvior’s model-based TTCN-3 testing technology includes a model-based test generator called MOTES that generates TTCN-3 test cases from UML state machines and the MessageMagic TTCN-3 tool for test development and execution.Andres Kull, CEO of Elvior, will give a presentation in the conference titled, “End-to-End Testing Automation in the TTCN-3 environment using Conformiq Qtronic™ and Elvior MessageMagic™” where an end-to-end model-based testing solution in the TTCN-3 environment using Conformiq Qtronic and Elvior MessageMagic will be demonstrated on a SIP softphone case study. Andrus Lehtmets from Elvior will give a tutorial in the conference titled, “Model-based TTCN-3 testing explained on a case study” where an end-to-end model-based testing solution using the Elvior MOTES TTCN-3 test generator and MessageMagic TTCN-3 test development environment will be introduced. Stop by our booth to chat with us and learn more about our TTCN-3 test automation technology. QA&TEST 2009, the 8th International Conference on Software QA and Testing on Embedded Systems took place Oct 21-23, 2009 in Bilbao (Spain).QA&TEST diffused the latest technological developments in Software Testing and Quality Assurance, and showcased successful best practices. QA&TEST brought together professionals and experts from different sectors.A presentation “Model-Based Testing of Reactive Systems” was given by Andres Kull, CEO of Elvior at the conference on October 22. The presentation focused on Elvior’s model-based testing technology. The technology includes the following tools:• MOTES – Elvior Test Generator that generates TTCN-3 tests from the UML model of system under test.• MessageMagic – TTCN-3 test development and execution platform that executes the generated tests against the system under test.Andres introduced the MOTES technology and discussed the benefits and drawbacks of using model-based testing in industrial-scale case studies. An end-to-end testing automation in TTCN-3 environment using Conformiq Qtronic and Elvior MessageMagic was demonstrated on the TTCN-3 User Conference 2009.This case study demonstrates how model-based testing approach can be applied in TTCN-3 environment to achieve full testing automation, from test design to test execution. Using commercial tools for automated test design such as Conformiq Qtronic and Elvior MessageMagic for automatic execution of these test cases, TTCN-3 driven test environment can now take full advantage of end-to-end test automation.We tested a publicly available SIP softphone, X-Lite from CounterPath, using TTCN-3 as testing language. The testing involved automatically generating TTCN-3 test cases using Conformiq Qtronic and executing those test cases using MessageMagic.We started by creating a system model, based on SIP specifications, in UML and Java compatible notation action language. This model is required by Conformiq Qtronic in order to automatically generate TTCN-3 test suite. Then we implemented a system adapter, needed to connect MessageMagic TTCN-3 execution environment to CounterPath’s X-Lite softphone, and executed this test suite against the X-Lite softphone using MessageMagic.The whitepaper describes the case study in more detail. The first TTCN-3 Tool Plugtests a TTCN-3 tools interoperability testing event is organized by ETSI 2-3 June 2009 in ETSI headquarters in Sophia Antipolis, France.This event will assess the TTCN-3 test tools compliance to TTCN-3 standards ETSI ES 201 873-1 V3.3.2 (2008-04), ES 201 873-4 V3.3.1 (2008-04) and ES 201 873-7 V3.3.2 (2008-04).The TTCN-3 tools will be assessed for their compliance to the standard based on the same agreed and standardized TTCN-3 test suite. The basis for the event are TTCN-3 test cases of the 3rd generation mobile reference test suite (ETSI TR 102 976).A testbed which will allow the execution of the reference test suite against its mirror test suite on different TTCN-3 tools will be provided by ETSI. Elvior will demonstrate on the event the interoperability of MessageMagic TTCN-3 test development and execution platform with other TTCN-3 test systems, as well as the ability of MessageMagic to handle complex, industrial strength TTCN-3 code for 3GPP LTE systems testing. 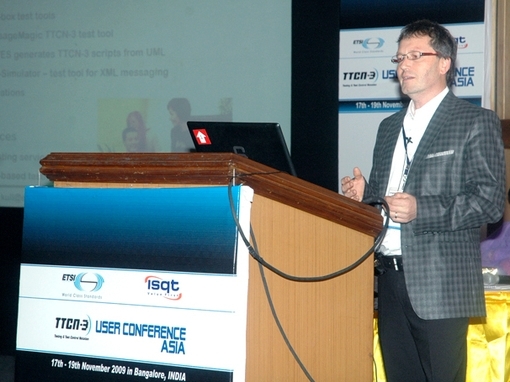 The TTCN-3 User Conference (T3UC) is an annual event which brings together the TTCN-3 community. 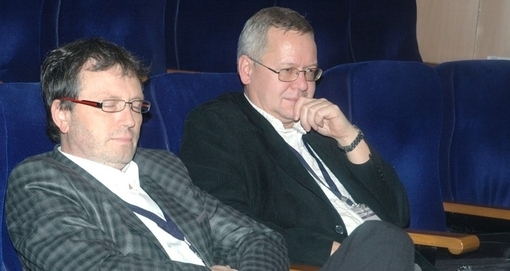 T3UC 2009 is organized by ETSI 3 – 5 June 2009 in ETSI, Sophia Antipolis. 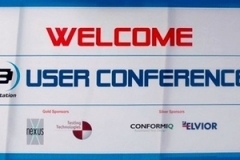 T3UC will feature tutorials and presentations from members of the TTCN-3 user community and other invited speakers.Elvior is supporting this event as a platinum sponsor and exhibitor, showcasing its TTCN-3 technology offerings. Elvior’s model-based TTCN-3 testing technology includes a model based test generator MOTES that generates TTCN-3 test cases from the UML state machines and MessageMagic TTCN-3 tool for tests development and execution.Elvior will give in the conference a presentation “Model based TTCN-3 testing – experiences from industrial case studies” where we will discuss about two practical case studies about applying our model-based TTCN-3 technology in practice.It would be a great pleasure for Elvior to meet you at the event. We are proud to demonstrate you the advantages of our TTCN-3 technology. 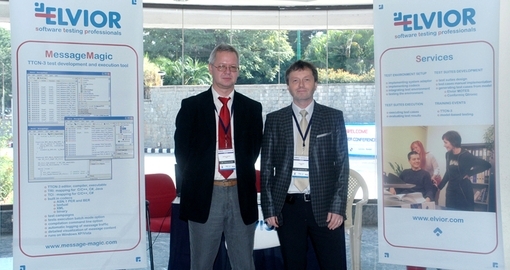 Come and talk with us about you test automation needs. We might have for you the solution.